Around this time of year I have a tendency to pull a Loralei Gilmore and be able to smell the next season. I may not be able to smell snow, but early in the morning and after the sun goes down, I can smell the approach of fall. Summer is my season through and through, but the coming of autumn is always so refreshing, especially when the humidity has been high like it has the past month. Autumn is definitely my favorite season for fashion. Layers and boots makes dressing so much easier. Today I'm sharing a new series called Save Spend Splurge where I'll post very similar items in three price ranges. The price ranges will really vary depending on the item, for example in general you would likely spend more on boots than you would a scarf, even if you are in the "save" category. So to kick us off, I'm sharing my three go-to fall accessories that when paired with any outfit can really step up your style. 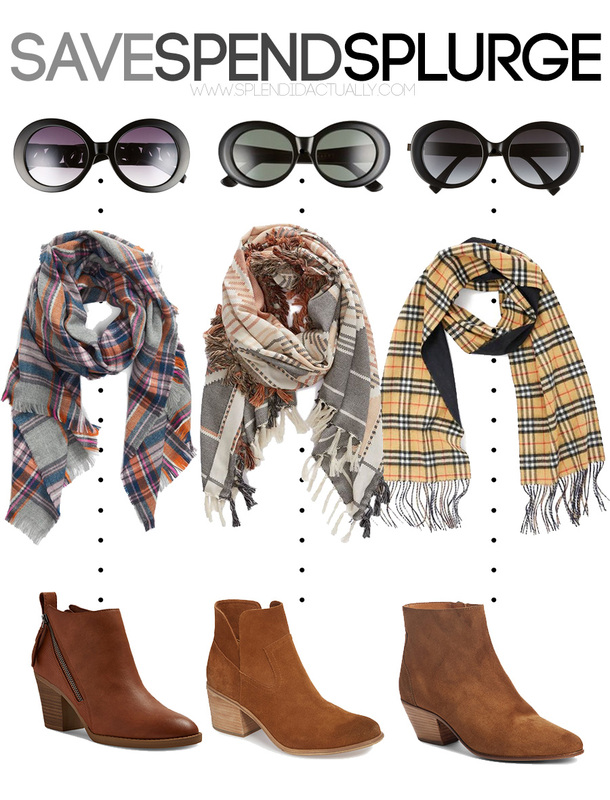 Jeans and a basic top, trousers and a blouse, a dress and cardigan or blazer - all of them can be accessorized with a great plaid scarf, giant dark sunnies, and a cognac bootie.